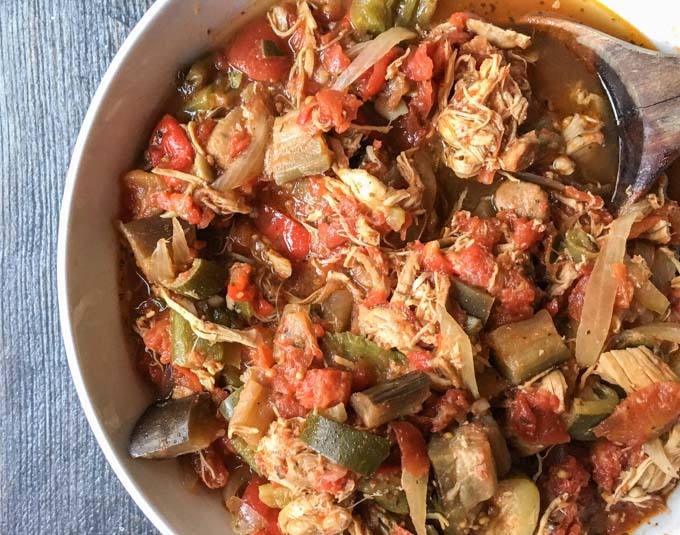 This slow cooker chicken ratatouille stew is a healthy and hearty dish that you can make in minutes. Server over rice or eat as is. I love ratatouille. I love the combination of tomatoes, eggplant, peppers and zucchini and could easily eat this on it’s own. However I wanted to make it a bit more substantial for a main dish instead of a side dish. So I add some chicken thighs and cooked it in a slow cooker. 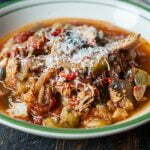 It was so easy and tasty that I’m sure we will be eating this slow cooker chicken ratatouille stew regularly. This week for Sunday Supper we are making Easy Supper Recipes so I thought this dish would be a good one to make. I think everyone likes slow cooker meals for busy week days. I mostly make meaty dishes like my pork roast or chipotle pork in my slow cooker but I also like it for veggies and stews. I have yet to make a dessert or drink but I think I’m going to give it a try this winter. On to the recipe. I started by chopping my veggies. I used onions, green & red peppers, eggplant and zucchini. I also used diced canned tomatoes because our tomatoes in the winter are not good here. For spices I used a lot of garlic as well as basil and thyme. And that is basically all that is in this dish. You add everything to the slow cooker and place the chicken thighs on top. Let it cook all day and then serve over rice. Easy peasy! I like it a bit soupy like you see above but if you don’t, simple leave the lid of the slow cooker off for the last hour or as long as it takes for it to cook down and condense. I hope you like this easy supper recipe and for more great recipes, scroll down for my friend’s from Sunday Supper. I made a quick video showing how I made it below. Enjoy! Pour oil into the slow cooker and then add onions and 2 cans of tomatoes. Add your garlic and spices and mix. Next put in your vegetables and pour the last can of tomatoes over top. Place the chicken thighs on top and cover with the lid. Serve over rice or eat as is. Previous Post: « Easy Italian Sub Salad – You won’t miss the bun! Perfection. Especially during the cold Midwest winter, this is exactly what I want to warm me up. I can’t wait to make a big batch of this stuff and eat on it for days! It does make a lot! Enjoy! I love ratatouille and this sounds a great variation. Your video shows how easy it is too! Thanks Caroline, it was really easy. 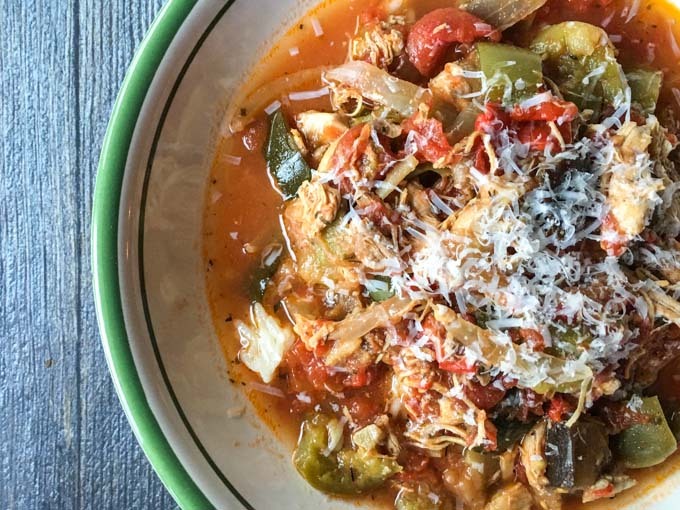 Like you I adore the flavors of ratatouille and adding chicken to it is genius! I’ve tried adding white beans to make it more substantial but I’ve never thought to add chicken. Brava Bella!!!!! Hi Monica, I love the idea of white beans! I’m going to try that next time. What a marvelous recipe! I’m a huge ratatouille fan, too—and I just won’t mention there’s eggplant in the recipe when I feed it to Bill. Maybe he won’t notice??? Absolutely gorgeous Denise! Definitely a keeper recipe for my slow cooker =) P.s. Did you ever see the Disney movie? That looks amazing! I love all those colors and flavors. Thank Christie! It’s very simple (like most of my recipes) but I really liked it! 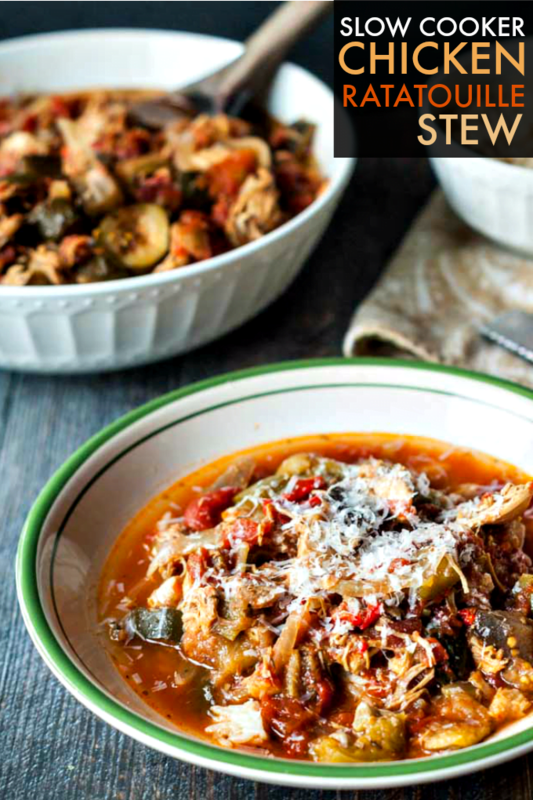 I can always use more slow cooker recipes! I bet this chicken gets so tender! Yes it’s more like shredded chicken.